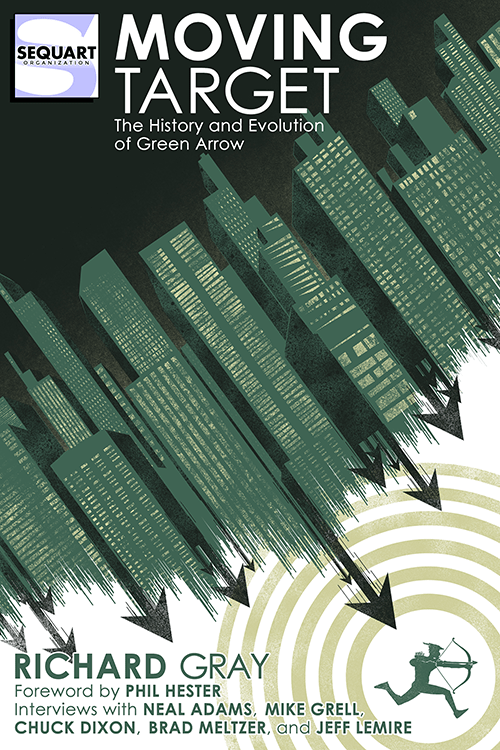 Back in November, The Arts STL’s Catherine Bathe used an edition of her column The Girl Loves Ink to give her thoughts on the collision between comics and academia as exemplified in the new Sequart release Moving Target: The History and Evolution of Green Arrow. That book’s author, Richard Gray, was kind enough to converse with Catherine about the book and all things Oliver Queen. Catherine Bathe: This book has a very academic feel to it. Where do you think comics fit in the grand scheme of the college classroom? Richard Gray: We’re definitely at a point where comics don’t have to fight for their place alongside other forms of literature. For a long time, any study of comics had to be prefaced with a justification of their “worth” in the college or university classroom, but thanks to some high-profile award-winners, that doesn’t seem to be the case anymore. There’s plenty of scope out there for serious study of comics, whether you’re reading them critically as part of a broad discourse in literature or gender/cultural studies, appreciating sequential art as a form of storytelling, or simply engaging in a close reading of the writer or art teams. With Moving Target, I definitely tried to take a more academic approach because Green Arrow is a character that has been around almost as long as Wonder Woman or Batman, but I was shocked to find nobody had tried to examine his whole “life” in this way. So it’s got an academic feel on one level, but I’ve tried to keep it light. Anybody should be able to find their way into this. My publisher, Sequart, is all about bridging the gap between academia and fandom. What kind of research goes into making a book like this? For me, it starts with the comics themselves. I’ve been a fan and a collector for decades, so it was back to 1941 and I read straight on through until 2016, which is Ollie’s 75th anniversary. You start to notice trends, recurring motifs, and almost overnight changes to a character who really did evolve over time. I’d also written a series of articles on Green Arrow for Behind The Panels, a podcast I co-hosted for several years. My secret advantage going into this is that I was a librarian, so I have super searching mojo working for me too. So while there may not be a lot of material on the specific creators or the character himself, a lot of research went into eras, art movements, or social issues surrounding a moment in time. There’s also the interviews. I was lucky enough to get Phil Hester to write a foreword, as well as on-record for a chat, in addition to Neal Adams, Mike Grell, Brad Meltzer, Chuck Dixon, and Jeff Lemire. Is Oliver your favorite super hero? Absolutely. It’s a combination of things. The “powered” heroes have never really appealed to me, so it’s always been the street-level heroes for me. I was already a fan in the early ‘90s when I started reading—just before they killed him off! The Kevin Smith revival was filled with history, and that was my turning point as a fan, encouraging me to go back and explore this rich history. Have you done work like this for other superheroes? Would you like to? Like I said, Ollie’s my favourite, so I’m not sure I’d have quite the level of fandom going into another hero. That said, Black Canary revealed a rich history in the course of researching, one that taps into multiple Earths. It’d be fun to break her down as a solo character, although her history is linked to GA’s. About the only other character I’d want to explore on this level is The Flash, mostly because he gives us the Multiverse, Earth Prime, and is quite literally the lightning rod at the center of the DCU. Failing that, let’s just say Detective Chimp. What’s your favorite Green Arrow storyline? Why? There’s at least two I always point to. Mike Grell’s The Longbow Hunters, because it’s a such a human story. A middle-aged Ollie living in Seattle with Dinah, the notion of Green Arrow as an urban hunter, and a seriously politically-charged story. It’s a perfect three-issue capsule that anyone can pick up and learn all they need to know about. I also adore the Elliot S! Maggin comics of the early to mid-1970s, where Ollie is just an everyman hero in a series of odd jobs. It’s very much like a proto-version of Matt Fraction’s wonderful Hawkeye stories of the last few years. What do you think about Oliver’s current incarnation in DC’s Rebirth? It’s leaps and bounds ahead of the New 52 version of the character. Benjamin Percy has tapped into Grell and O’Neill and some similar eras, but kept it fresh and contemporary as well. It’s not quite the Ollie of old, but it’s closer. At least the beard is back! If you could change anything in the Green Arrow continuity, what would it be and why?